Despite people telling me Tanah Lot was too touristy, I decided to finish off my first, full day in Bali by watching the sunset there. I figured I’d be fighting hordes of selfie sticks once I arrived but couldn’t resist the urge to go and see for myself. In the end, people were right - Tanah Lot is super touristy. However, I’m glad I went. The experience was a nice way to kick off my trip. I got to reawaken my love for riding a scooter, explore tide pools, photograph a gorgeous sunset, and witness a massive bat colony take to the sky. Tanah Lot is an offshore rock formation about 30 minutes northwest of Canggu, Bali. Perched on top of it is a Hindu shrine which dates to the 14th century. 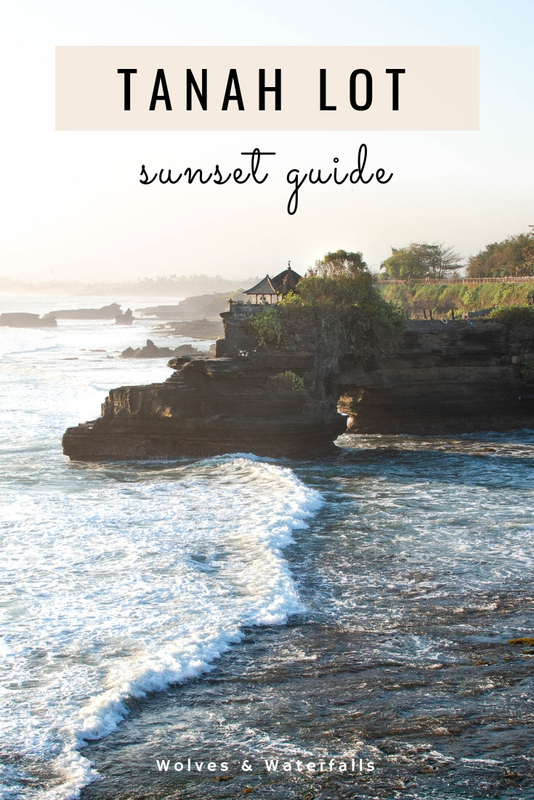 Travelers flock to Tanah Lot because it’s one of the most well-known and beautiful places to see the sunset in Bali. Very! But please don’t let that stop you. Most tourists crowd around the temple, leaving the surrounding area fairly empty and perfect for sunset viewing. 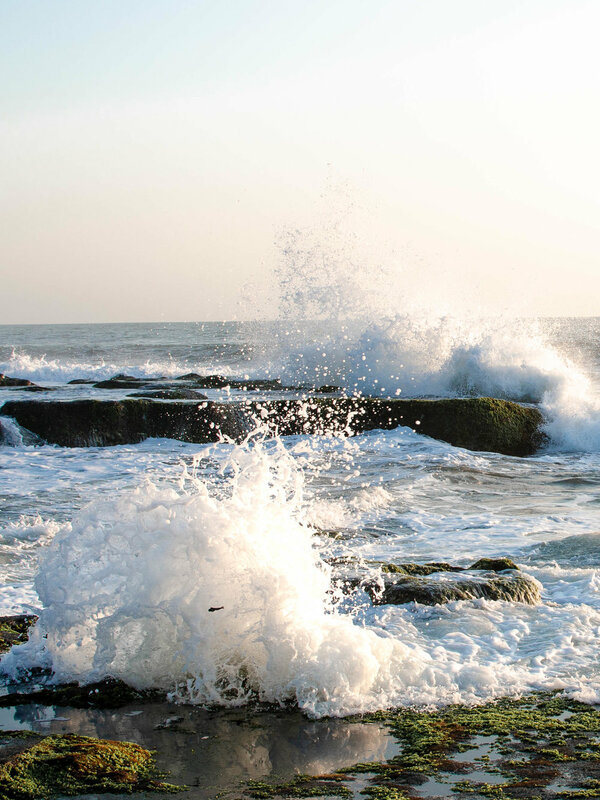 The whole experience of visiting Tanah Lot is more than just staring at a temple too. It’s an exhilarating scooter ride, a gorgeous walk along the coast, and a brilliant sunset. If all you do though is show up at Tanah Lot and take a quick selfie, it may not be a memorable night. 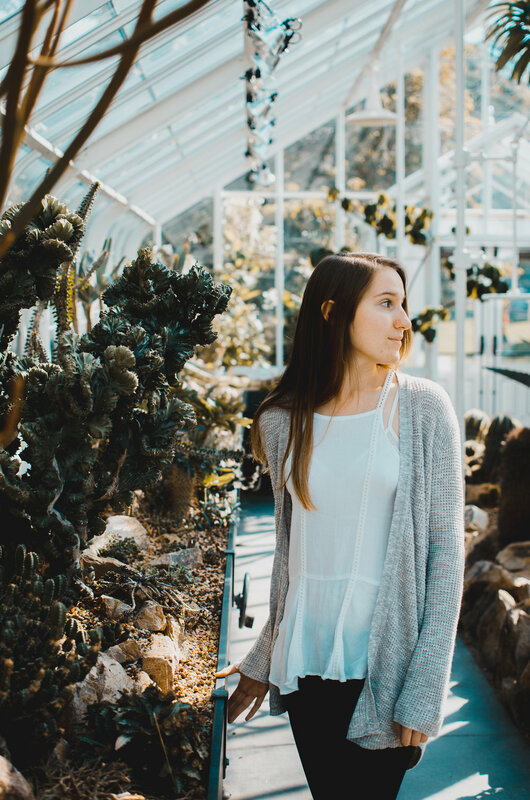 Take your time and explore instead. Check out the tide pools if the tide is low and keep an eye out for the huge bat colony which takes to the sky right as the sun disappears. You can hire a taxi to take you to Tanah Lot or rent a scooter and drive there yourself. From the main strip in Canggu, the scooter ride to Tanah Lot takes about 20-30 minutes. By car, the ride usually takes a little longer since taxis can’t pass traffic as easily as a scooter can. From central Canggu, drive in the opposite direction of the ocean. Once you hit Jl Raya Canggu, turn left and head straight until you see the turn for Jl Raya Tanah Lot. Turn left onto that street and you’ll eventually run into an entrance gate. After you pay the entrance fee, park your scooter in the parking lot and then walk the rest of the way on foot. Scooters aren’t allowed past this point, but it’s only a short walk down to the temple. TIP: If you’re worried about getting lost on the way to Tanah Lot, get a sim card or download the offline map for Bali. This way you can stop and check your location along the way. If you visit Tanah Lot during low tide, there are a ton of tide pools to search through. While I was there, I saw tiny eels, a few fish, and a bunch of crabs hiding out in them. 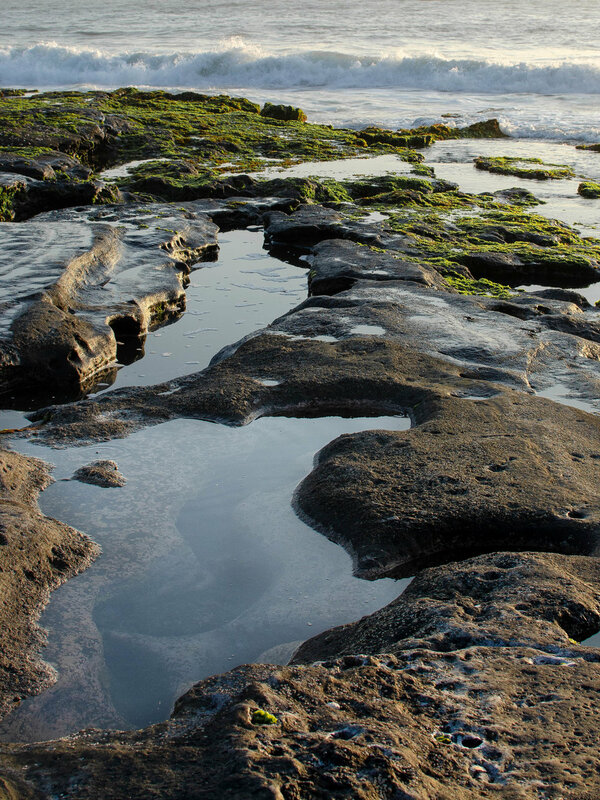 The tide pools also made for an arguably better shot than Tanah Lot itself. One of the best surprises at Tanah Lot was the huge colony of bats which appeared right as the sun went down. 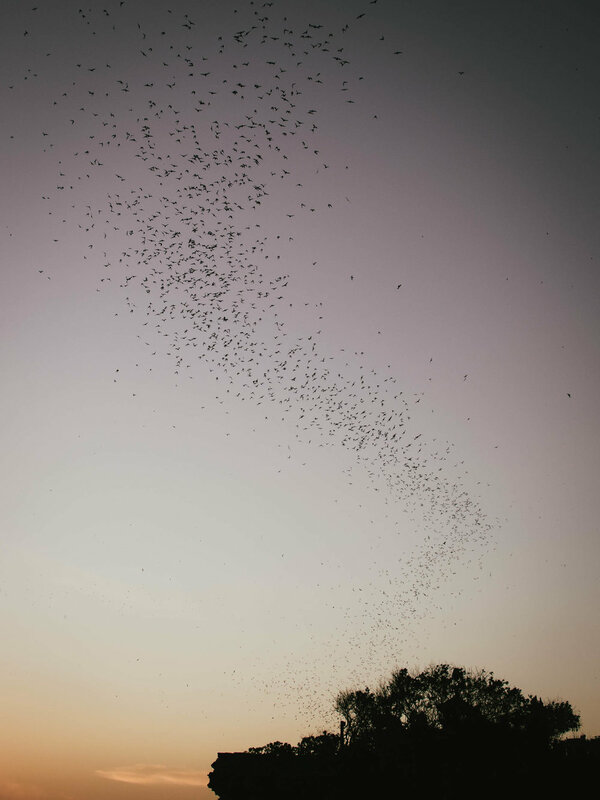 As if straight out of a movie, the bats rushed out of their cave in perfect order - forming a wave in the sky. I’d never seen so many bats in one place before, let alone flying in formation. For photos without a bunch of tourists in them, point your camera at Pura Batu Bolong. This temple neighbors Tanah Lot and stays empty of people.